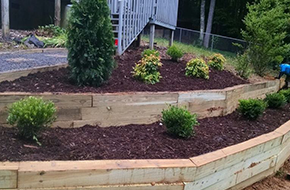 We can give you the garden of your dreams at Nicholas Landscaping Service Inc in Asheville, NC. Contact Nicholas Landscaping Service Inc for a free consultation or free estimate for professional landscaping and hardscaping! 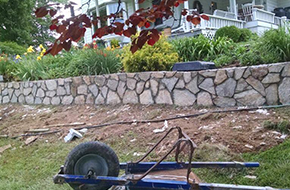 Nicholas Landscaping Service Inc have the greenest fingers, creating the finest landscapes in Asheville, NC! At Nicholas Landscaping Service Inc, we specialize in bringing the personal touch to your garden. Through a thorough consultation process we find out what it is you dream of having in your outdoor spaces and then we make it happen before your eyes! When we landscape gardens, we customize them to our customers' preferences and uses so that you know you're going to love it for many years to come. You can add considerable value to your property's value as well as its appeal through a professional landscaped garden and with our affordable rates, everyone has the opportunity to achieve this transformation. You may think your ideas of a tree house or a walled garden are way too hard or expensive to achieve but we're in the business of making your landscaping dreams a reality. We can make sketches that incorporate all the features you're looking for so that you really get a personalized landscape that perfectly suits your needs. If you want to see color springing forth from your flower beds any time of the year, our expertise allows us to know exactly the flowering shrubs and plants to choose from. If there's a particular color you want to see accented throughout your garden, we can assist you with that. Because of the length of our experience, we can make great recommendations and suggestions too! Having worked on landscapes in Asheville, NC for ten years, we have seen everything and that gives a wealth of ideas that we can pass on to you too! We go the extra mile to deliver results that delight because we want you to tell all your neighbors and friends how great our landscapes are. 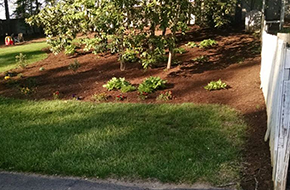 If you want to get the most from your back yard and have the time on your hands to enjoy it, let Nicholas Landscaping Service Inc do the hard work for you!